The compost keeps evolving fine with temperatures above 110°F at the active pile and a bit below 100°F at the maturing pile. 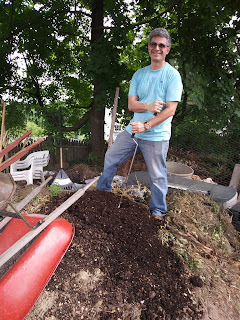 Marcelo and I added some browns to the right pile by tearing apart some seedling containers and a wet corrugated cardboard box. But we're still low and at this rate will run out of browns very soon. So... WE NEED EVERYBODY TO CHIP IN, IN ORDER TO AVOID INTERRUPTIONS: If you happen to still have some dry leaves around, PLEASE BRING THEM and add to the browns pile (rightmost one) when you come to drop off your scraps. Other suitable browns are cores of paper towels / toilet paper rolls, egg cartons, brown paper bags, or other low-quality paper/carton, always cut, shredded, or torn into small pieces (nicer paper is best recycled). Sawdust is good but may require a closed container and careful handling to avoid a mess, AND the wood has to be untreated. Just in case, a bit of info: remember that "browns" is a shorthand for materials that are high in carbon. "Greens" is shorthand for materials high in nitrogen. BUT don't judge just by the color! For example, coffee grounds are brown in color, but are high in nitrogen and thus considered a green in composting. I hope this is not confusing! We'll be offering a mini-training / refresher soon. In the meantime, feel free to contact me with questions. 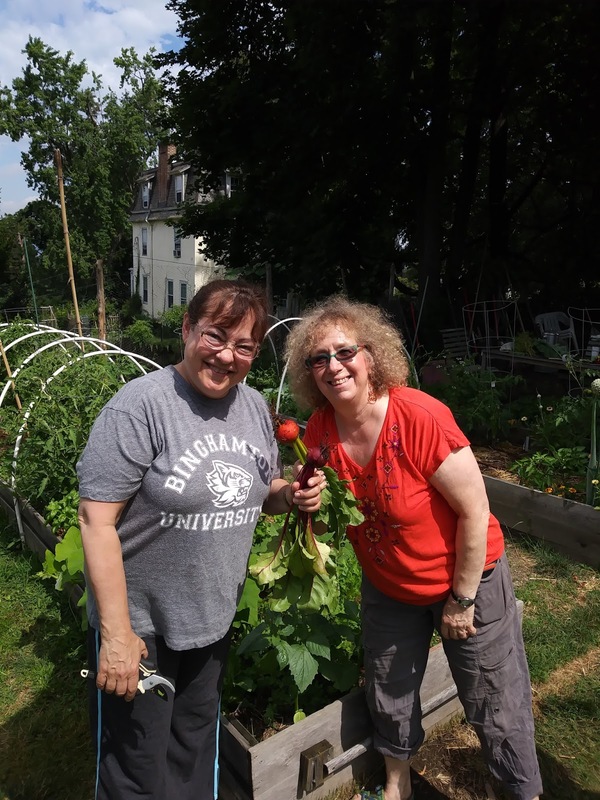 It was another busy morning at the garden! Blanca, Ben, Iris, Linda M, Marcelo, Susan, and Gabriela were in attendance, and Akiko stopped by for a while. 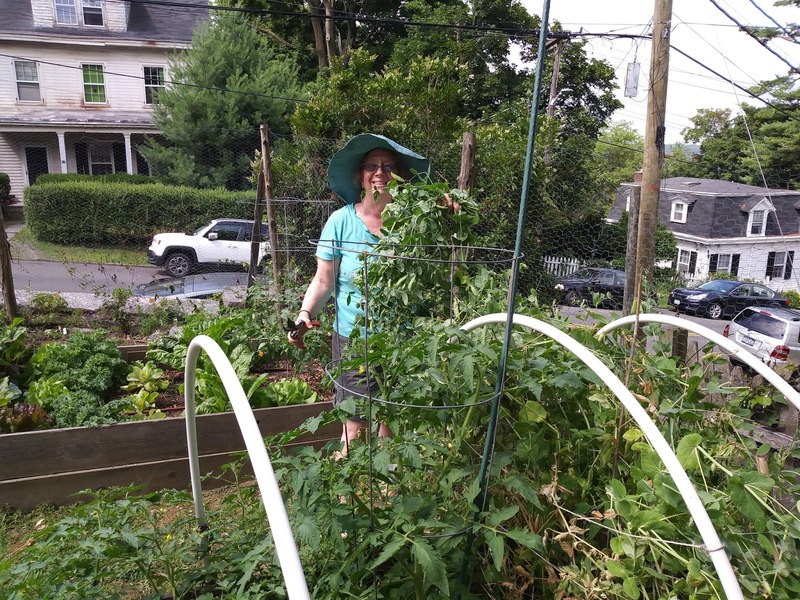 In addition to the usual weeding, harvesting and watering the areas outside the irrigation system, Blanca arranged the tomato plants inside the cages and tied them up. 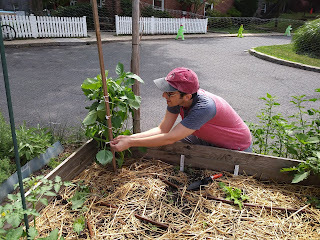 We also planted eggplant, pepper, leek, and Brussels sprout seedlings donated by Hilltop Hanover Farm (THANK YOU!!!). 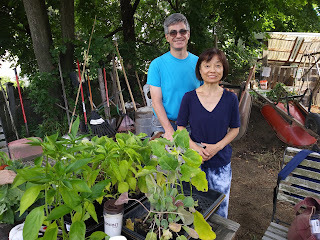 Linda brought the weed tea that Els had brewed for the garden--we will probably use it as a soil drench but did not get around to applying it yet. Gabriela applied more vinegar-based weed killer to the poison ivy at various spots and checked the compost bins. 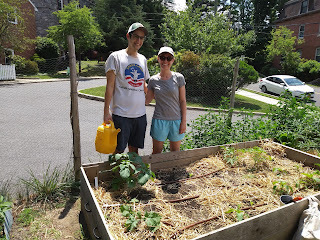 We also took care of some of the containers with failed seedlings: the soil went to the potato pots; Marcelo and Gabriela cut the cardboard containers (along with a wet corrugated cardboard box) and added to the pile of "browns" for composting. Blanca and the first beet of the season! 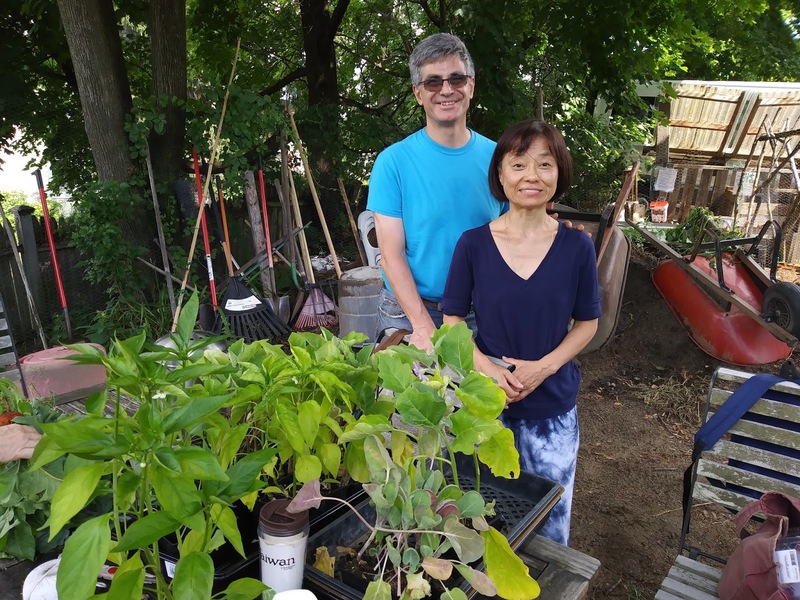 Mark and Akiko brought seedlings donated by Hilltop Hanover--THANK YOU ALL!!! 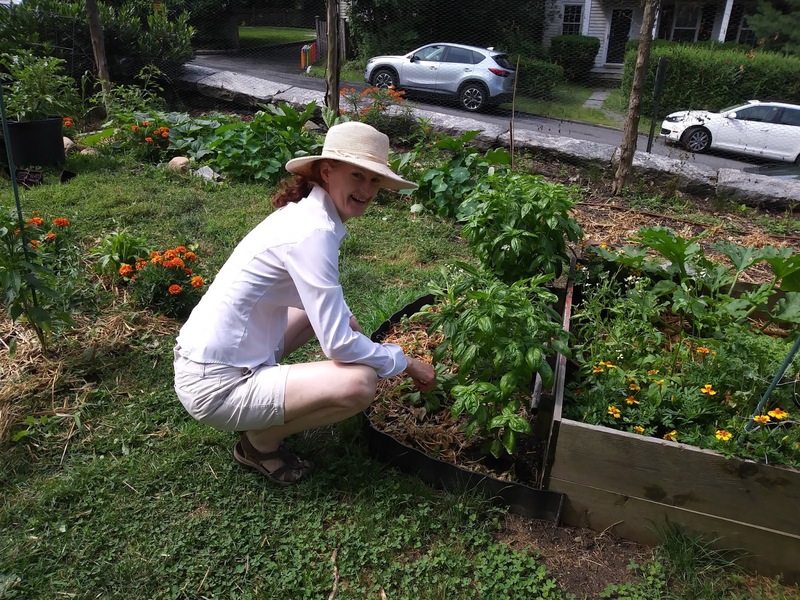 Susan tending to her bountiful herbs. 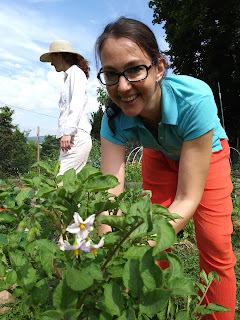 Gabriela adds soil to the potato containers. 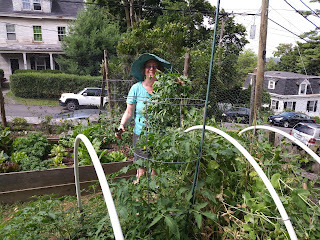 It was a busy morning, and almost everybody came to the garden this Saturday. 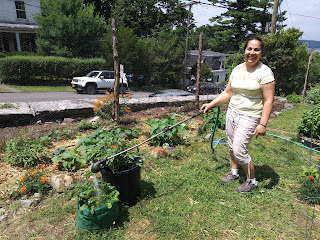 We were all excited about the newly installed drip irrigation system and faucet inside the garden! It looks great and very neat. Now the garden will be watered overnight. We still need to keep an eye to check whether the schedule might have to be adjusted. 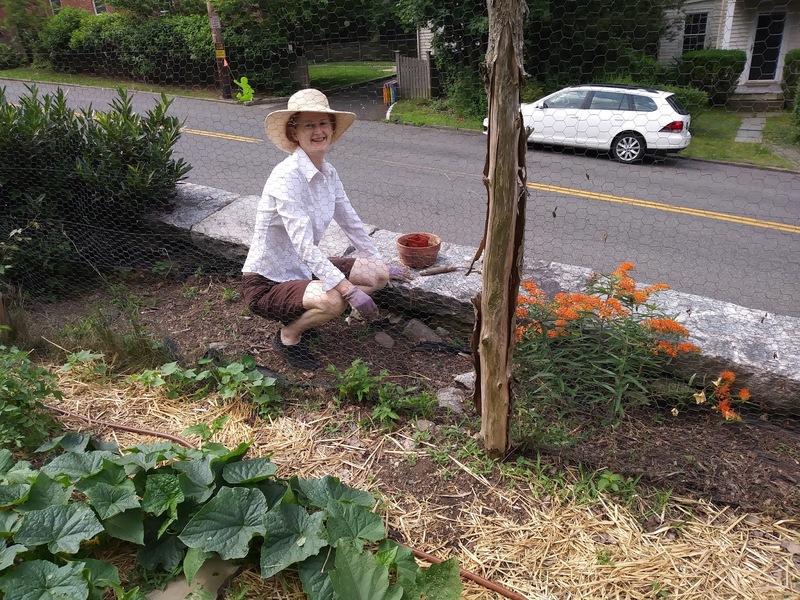 In addition to the usual weeding, harvesting and compost management, Susan also brought some flowers and purple basil for the outside of the fence on Oak St. The other big thing this week was that Iris got some asparagus crowns. We made room at the back of the garden and planted two rows. While we are not sure when the plants will emerge, this is a great addition because asparagus are perennial and should keep producing for several years (spears are harvested in early spring). Els had volunteered to prepare a foliar spray (fermented wild weeds tea) according to a recipe Doug DeCandia had shared in his class. The brew is now ready and Els will bring it to the garden next week. Thank you Els!! Susan planting herbs and flowers outside the fence. 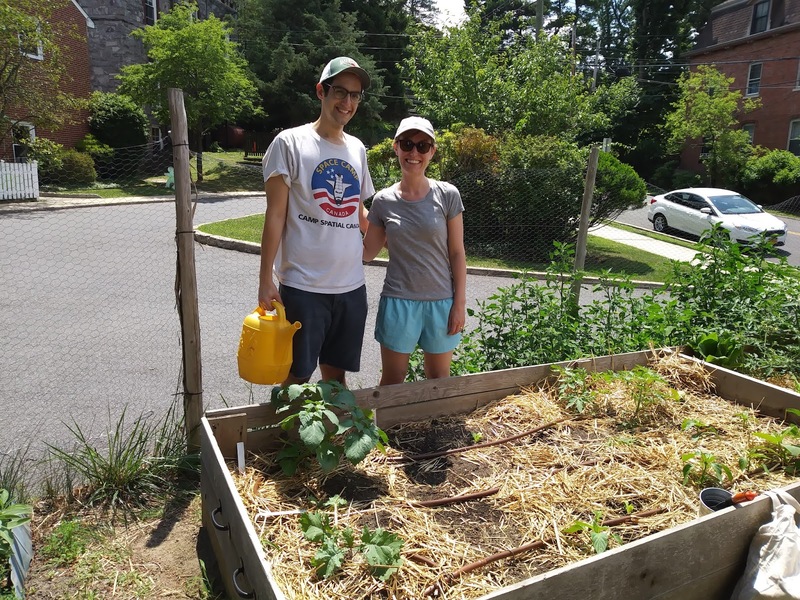 Our newest gardeners, Ben and Carolyn, check on their plot. Marcelo mixing the curing compost pile. 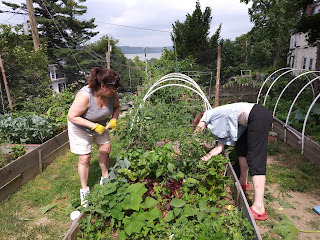 Linda M. and Els tending to their plot. Blanca and Laura weed the area where we'll plant the asparagus. Iris taking down the peas. 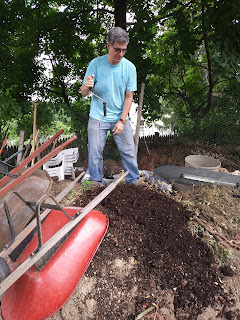 Compost update - July 1st. More people are composting with Roots & Wings, which is great but comes with some challenges! 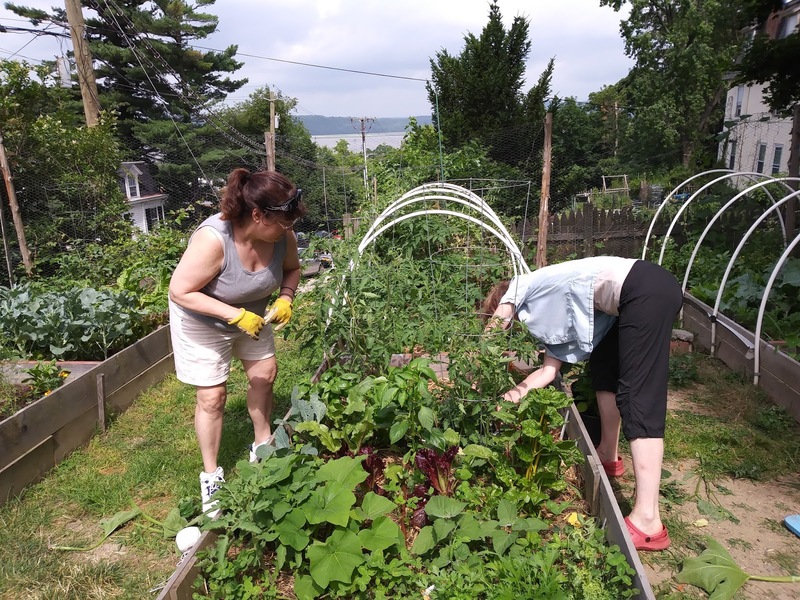 Browns (i.e., carbon-rich materials) are consumed much faster than before, and bins are filling up faster than the older compost is mature enough to be used. 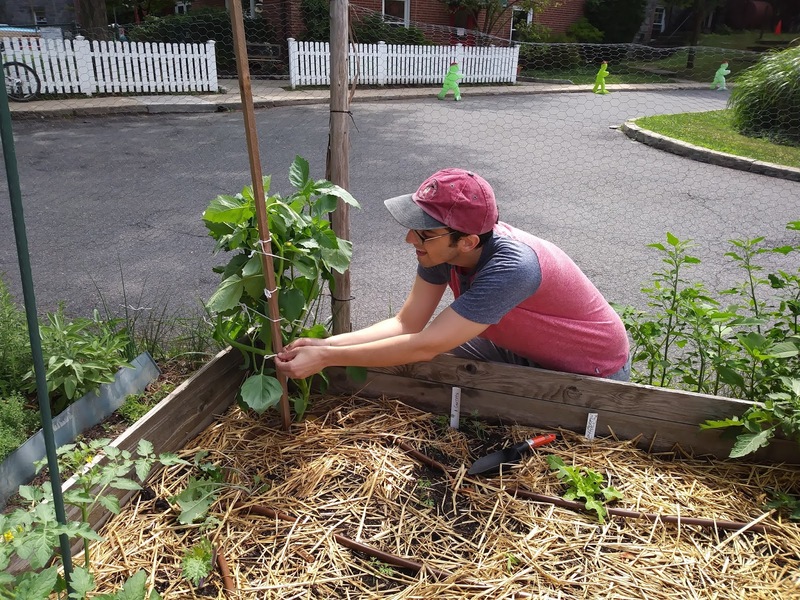 We are considering a few options to sustainably deal with these issues, which will likely require more help and participation from all composters and some creative ideas. We may have a brainstorming session soon but your ideas are certainly welcome at any point! The most urgent issue is to restock on browns sooner rather than later. If any of you has more dry leaves that you could bring and drop off in the rightmost bin, please do so at your earliest convenience so we can avoid completely running out of browns like last time. If you have other source of browns (e.g., sawdust, please let me know--if we are to use any woody materials we need to make sure they are untreated). 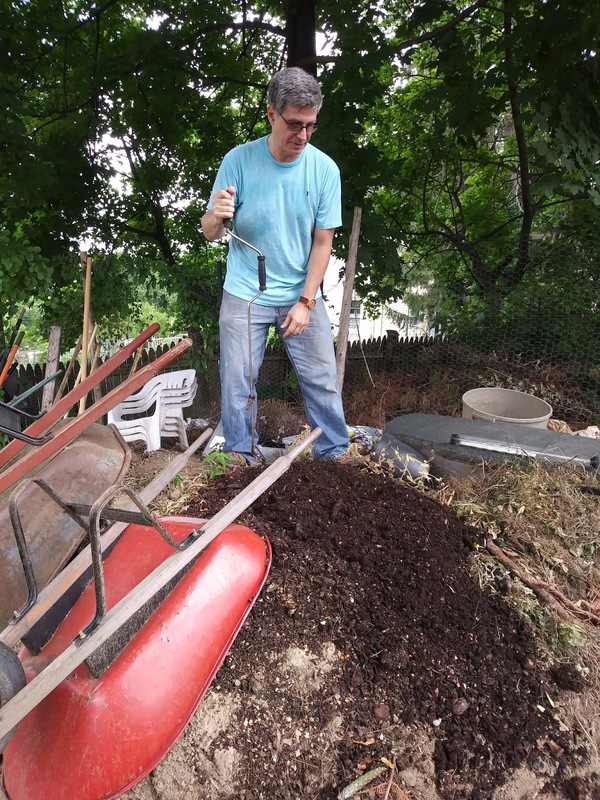 Between June 17 and June 22, Marcelo moved the middle pile (maturing compost) inside the garden into a hole he dug into our "bad soil" pile. We hope the compost will finish curing here and some of it will help improve the quality of the soil for future use. He also moved the left pile into the middle bin, making room for new scraps. 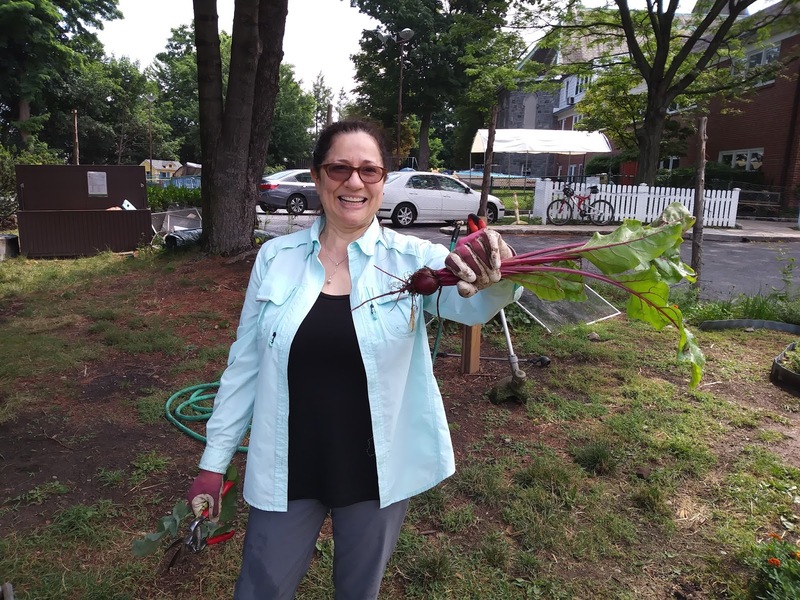 There was a lot of activity at the garden; Blanca, Els, Solange, Mark P., Laura, Susan, Linda H., and Marcelo were in attendance. 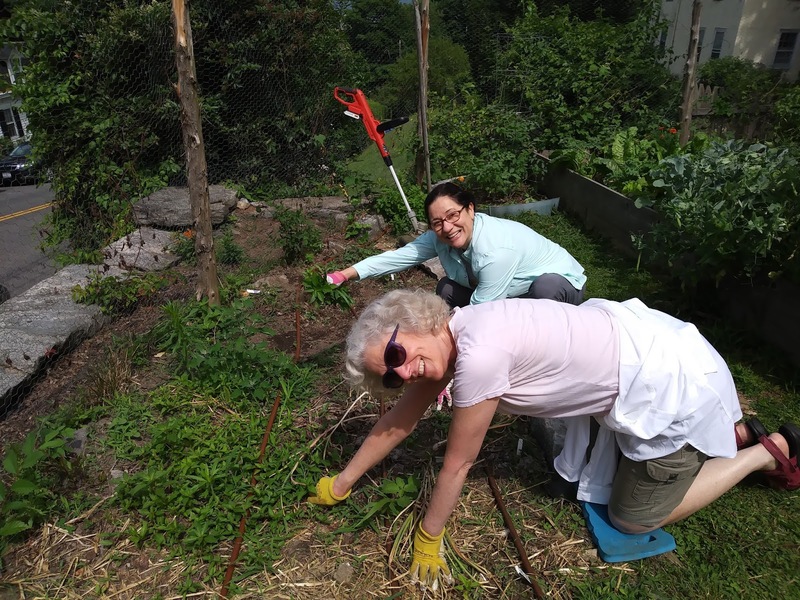 Activities included planting new vegetables, weeding, adding soil to the potatoes, turning the compost, cleaning the area behind the fence and drip irrigation planning. One of the big topics of the day was getting ready for the installation of the drip irrigation system. A contractor (5 Brothers) will be doing the work on Wednesday and we need to figure out where to locate the spigot. The gardeners met with Dave Person (who has been helping us figure out the technical details and coordinate with the church) and showed him two different spots we thought would be good for the faucet. We market both spots with sticks and thought 5 Bros. could pick the one they thought would be better for running the irrigation system. 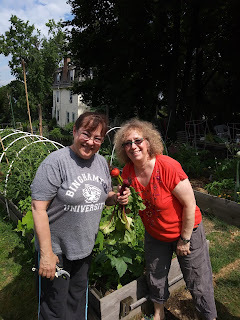 Susan and Solange will be at the garden on Wednesday at about 9:30 to go over some of the details. 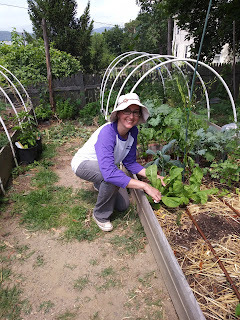 Marcelo also gave Molly, from the food pantry, 8 heads of lettuce that were ready for harvest.